More than 1.5 million downloads and a 4,3 star rating! Give it a try, and see if you get addicted!!!!! WARNING - ONLY FOR SMART PEOPLE !!! 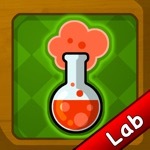 Crazy Formula is a truly addicted puzzle/board game where you arrange lab tubes so special formulas (different colors) can pass throw and arrives to the final component in the write way. You can split the formulas (colors), mixing two or more formulas to achieve a different one, change colors, delay flow, etc. This app has a 3.7 star rating (1536 ratings). It occupies the 339543th position in our ranking with 51 points. It is among the 25% best ones of the overall top.